Stronger families? Lower taxation? Action on climate change? In this month's ConservativeHome survey we seek your views on the future of Gordon Brown, David Davis and Caroline Spelman. We also want to know what you'd most like the next Conservative Government to achieve: Stronger families? Lower taxation? Action on climate change? Iain Dale suggested five names for inclusion in the shadow cabinet yesterday: Greg Clark, Damian Green, Ed Vaizey, Maria Miller and David Burrowes. We agree with all of those suggestions although Justine Greening is a more likely bet than Damian Green. Greg Clark is certainly one of the party's most outstanding talents (we tipped him for the top on 3rd January). Alongside Michael Gove, Nick Herbert and Jeremy Hunt (our three to watch) he will be one of the party's biggest guns in the years to come. David Burrowes is another excellent tip and it would be good to see him go to a post like international development. David has believed for a long time that international development should be central to Conservatism and he would lift its status enormously. More difficult for David Cameron is who to remove from the top table. He may make one or two demotions but is unlikely to drop five shadow cabinet members. Caroline Spelman - regardless of the outcome of the inquiry into her employment of her nanny/ secretary - is very vulnerable. Most party members would like to see her replaced by Eric Pickles. Away from the shadow cabinet, who would you like to see promoted from the backbench to the frontbench? Top of our list would be another Greg, Greg Hands. Greg is hugely industrious and played an important behind-the-scenes role in Boris Johnson's campaign and has also been part of the extraordinary Tory revival in Hammersmith & Fulham. Stephen Crabb is another MP deserving of the frontbench. A role consistent with his interest in human rights, international development and foreign affairs would be a particularly good match. We'd also like to see rehabilitation for some of the talent that has left the frontbench for different reasons during David Cameron's leadership. We think of Graham Brady (who left on a matter of principle), Mark Field and, of course, Patrick Mercer. Restoring one or more of this group to the frontbench - Mark Field would be excellent on economic and legal issues, for example - would show that there was a way back into Team Cameron even if there had been a difference in the past. What questions should we include in the June survey? It goes live tomorrow morning. Another poll! A ComRes poll for the Independent has the Conservatives 21% ahead, the highest rating and biggest lead for any party since ComRes began polling for the paper in 2006. Brown may be dragging his party's support down as more of those polled actually said that they regarded themselves as supporting Labour (27%) than Conservative (26%). 13% of those Labour "identifiers" intend to vote Tory, as do 14% of LibDem identifiers. Only 4% of LibDem identifiers say they will vote Labour, while 7% of Labour identifiers intend to back the LibDems. Encouragingly, 74% of Tory supporters are absolutely certain to vote, compared to 58% of Labour supporters and 50% of LibDems. We're ahead of Labour amongst every age and social group and in every region except Scotland. Brown's first year in office has seen the fastest fall in personal ratings for a Prime Minister ever recorded. His ratings are currently as low as John Major's were after Black Wednesday, in the years before Labour's 1997 victory under Tony Blair. Brown's first year also sees the deepest economic gloom Ipsos MORI has recorded since 1980: seven in ten people (69%) now believe that the general economic condition of the country will get worse over the next 12 months. Almost three quarters (73%) of the public are now dissatisfied with the way the Government is running the country, and just one in five (21%) are satisfied. Seven in ten people (69%) now believe that the general economic condition of the country will get worse over the next 12 months; this is the lowest score Ipsos MORI has recorded since March 1980. 6pm: Graphic added (although UK Polling Report is cautious about comparing with previous MORI polls because of methodology changes). According to The Times, Sir Simon Milton - adviser to Boris Johnson and leader of the Local Government Association - believes that profit-making companies should be permitted to run schools and fire under-performing teachers. We agree. The average school building and grounds are hugely under-used for large parts of every week and for the summer and Christmas periods. Teacher unions have predictably opposed the idea but surely there must be a way of encouraging private firms to "sweat" school buildings so long as a high proportion of the proceeds go back into the school. The proceeds could help to pay for higher pay for the best teachers - another recommendation from Sir Simon. Michael Gove is stating that “the money we spend on education should stay within education.” This doesn't sound like a closed door to private firms using school facilities to earn extra money and being allowed to keep some of the returns. Michael Portillo has said that Party Chairman Caroline Spelman should quit. The former Defence Secretary made his intervention after it was revealed that Mrs Spelman's former secretary, Sally Hammond, revealed that she was "shocked" at how much Tina Haynes, the nanny, was being paid a decade ago. A ConservativeHome poll of 955 members (published last Thursday) found that most members thought Mrs Spelman should stand down while her case was being investigated by the Parliamentary Commissioner for Standards and that Eric Pickles should succeed her. We stand by our view that Mrs Spelman will be exonerated and that she should not step down. To do so would only encourage vexatious complaints against MPs and other public figures. That hasn't stopped speculation throughout this week that (post-Henley) she may resign. An announcement could be made as early as today. On Gordon Brown's first anniversary as PM Labour come fifth in Henley - behind the British National Party and the Greens. Labour also lost its deposit. The Conservatives have a new MP - John Howell, pictured above, with Chris Grayling MP just in the background. The Conservatives won a majority of 10,116 over the LibDems. The Conservative share of the vote (57%) actually went up. The LibDems (28%) tried to run a negative campaign but it failed. Their by-election machine will need an overhaul after this. Many congratulations to Dr Howell and the whole Tory campaign team. > ConservativeHome's reports on the Henley campaign. Labour have narrowed the gap to 18% according to a new YouGov survey for The Telegraph. Who do you think will win the next election? Lab 62% Con 18% a year ago. Now Lab 16%, Con 67%. Asset or liability to the Labour Party? 48% asset, 25% liability a year ago. Now 21% asset, 61% liability. 49% say Brown is doing a worse job than Blair. Only 8% say he is a better Prime Minister and two thirds say their opinion of Brown as PM has gone down over the last year. 71% say Government doesn't have a clear sense of direction. Tory backbench MPs lined up earlier today to attack Harriet Harman's Equality Bill. We post two of their contributions below - alongside more qualified concerns from Theresa May, Ms Harman's opposite number. The Bill does a number of things that many Conservatives will support. This includes action against discrimination by age. Such discrimination is clearly wrong when it means an NHS patient gets inferior treatment because of their age but the legislation must be sensible. Can it be wrong, for example, to allow a travel insurer to discriminate against a very old, frail passenger? 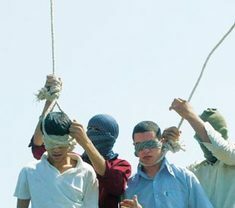 What really worries Conservative backbenchers - reportedly dismissed by John Bercow MP as the "Taliban" tendency* - are the provisions which will allow firms to discriminate in favour of people on the grounds of their gender or ethnicity. Over at CentreRight Andrew Lilico argues that this right to discriminate will mutate into a de facto requirement to discriminate as firms who prefer the old-fashioned approach of appointing purely on merit are probed for "imbalances". Harriet Harman made it clear today that the Government is ready to use public procurement policies to force private firms to be more open about their employment policies. The Labour benches lapped up Ms Harman's announcement earlier today and her strategy makes sense from her party's narrow interest in shoring up support amongst its base supporters. We might see a lot of legislation like this coming forward from ministers who recognise that the electoral game is probably up for them but that two years is a long time in government and they might as well use that time to legislate. Paul Uppal is our candidate in Wolverhampton South West. For reasons that are obvious from the photograph in his blog masthead he's in a stronger position than most of us to take on the race relations industry without being accused of racism. That may not stop some commentators, of course. "It is with particularly sadness that I recently heard that James McGrath (Chief of staff to our previous Chairman) has been pushed out of his job working with Boris Johnson. Accusations of racism have been levelled against him, as a few words have been taken out of context and jumped upon by the PC brigade. I’ve met James on numerous occasions and found him to be a warm, witty and charming individual. As someone who prides himself as being fairly astute at spotting such things, I am wholly convinced that he does not possess a racist bone in his body. Rather he appears to be the victim of the McCarthyistic mouth foaming utterances of the race relations industry, which through accusation alone can slay political careers and stifle well intentioned and principled debate. I say this because I have seen with my very own eyes the modus operandi of this circus which employs individuals to perpetuate this climate of political correctness. In reality this industry/business does dreadful damage to Britain’s real race relations. It seems more concerned with securing it’s own funding streams and non jobs for it’s membership of zealots. The cost of this is all is so much more than financial, as we lose decent people and gag those who point to the emperor’s new clothes." Well said. We look forward to Paul coming into Parliament as soon as possible. 12.18pm: If you want to ask questions call an election, Cameron responds. Brown says the Conservatives aren't making the big decisions. He says Labour have made all the big decisions on nuclear power, airport expansion and housing. David Cameron, he says, ducks all the big decisions. You can get away without substance some of the time, but not all of the time. The Conservatives are only offering opposition for opposition's sake. 12.16pm: David Cameron says "no plans" doesn't mean anything from a PM who said he had "no plans" to raise taxes. This is a PM who is about to sit down with the unions - the unions who provide 92% of Labour income - and the unions only see weakness when they look at Brown and know he'll lurch to the left if they push hard enough. 12.15pm: In David Cameron's second set of questions he turns to industrial relations and asks for a categorical assurance that Conservative union reforms won't be weakened. Brown says he has "no plans" to change union laws but invites the Conservative leader to say that he will commit to three year public sector pay deals. 12.11pm: Before he became PM, people thought he was a man of principle says Nick Clegg. Will Mr Brown meet the Gurkhas who are surrendering their medals today in protest? The PM responds by saying that the Government is improving pension arrangements for serving and some retired Gurkha servicemen. The LibDem leader says that the PM is missing the real issue. Gurkhas have to rely on charity and risk deportation because this Government won't give so many of them citizenship. 12.07pm: Cameron says EU sanctions must mean visa bans and asset freezes on the families of the regime as well as the regime leaders themselves. He also says that businesses have a responsibility to divest from Zimbabwe if they are sustaining the regime. Brown says that more moves are being taken to identify every member of the "criminal cabal" surrounding Zimbabwe and subject them to the overall sanctions regime. 12.05pm: David Cameron welcomes sporting sanctions against Zimbabwe and asks what it practically means to end recognition of Zimbabwe. Brown says Britain is bound by international laws and can't completely ignore the legal fact that Mugabe remains Zimbabwe's head of state. Says lots of other things but doesn't answer question. 12.03pm: David Cameron asks about Zimbabwe. Calls for G8 - due to be attended by South Africa - to have declaration on Zimbabwe that commits S Africa to tougher line. Brown promises to raise the issue at every international gathering. Last night Greg Barker, Shadow Minister for Climate Change and the Environment, launched his Root to Branch pamphlet on embedding an understanding of the environment into education. Click here to download the pdf. David Cameron was there and praised Barker's work. He joked about how he was involved in his leadership campaign at a stage when they could have had team meetings in a taxi, or even in the front of Barker's sports car. He went on to speak about using Conservative means to tackle climate change, and how centre-right political leaders around the world had been asking him how he'd managed to get a conservative party so focused on the environment as an issue. Mr Wheeler has previously said that he would study the judge's verdict before deciding whether to appeal. "Global Vision is disappointed with the ruling today by Lord Justice Richards and Mr Justice Mackay that the Lisbon Treaty is materially different from the Constitution. The Government, therefore, is considered within its rights to break its promise to hold a referendum on the new EU Treaty. “Under these circumstances, the British people are surely entitled to their referendum on the Treaty as the Irish people did. All our polling shows an overwhelming majority in favour of a referendum.”"
Jeremy Hunt MP, Shadow Culture Secretary, gave his first big speech on the arts yesterday evening. He was speaking to Peter Whittle's increasingly influential New Culture Forum. Within the audience were Sir Nicholas Serota, Director of Tate Modern; Nicholas Hytner, Director of the National Theatre; Neil McGregor, Director of the British Museum; and Colin Tweedie of Arts and Business. The creative industries are vital to the British economy and regeneration. They account for 3.7% of the national income and 1.9 million jobs. No social regeneration project is complete without a strong creative sector dimension. Labour has done many good things for the arts but the renaissance began under the Conservatives in 1994 with the establishment of the National Lottery. He noted that the Lottery had provided £3.8bn for the arts and £4.1bn for heritage. Labour had, he said, reduced funding for the arts by raiding the Lottery pot and taking from what was originally intended for the 'four pillars' - arts, heritage, sport, local community causes. A Conservative Government's National Lottery Independence Bill would restore the exclusivity of Lottery funding for the four pillars and this would mean nearly £100m more each year for the arts and heritage. More private charity. Further to ensuring that the arts received more public funding he also said that Conservatives would do more to encourage private giving to good causes. Saluting the work of Greg Clark MP, Shadow Charities Minister and his co-author of papers on 'progressive conservatism', he said that £3bn to £4bn extra could be made available to the arts and other good causes if giving rose to 1% as a percentage of UK national income, from its current level of 0.7%. This shouldn't be impossible given the huge wealth in the City, for example. In the US philanthropy is at 1.7%. He discussed streamlining gift aid, using the honours system for recognising major philanthropists and encouraging endowments but most important were new social norms. Giving to charity must become as normal as leaving a tip of 10% at a restaurant, he said. Both Greg Clark and Jeremy Hunt have been strongly influenced by Daniel Finkelstein's thinking on the importance of social behaviours. Less bureaucracy. Jeremy Hunt promised to look at the bureaucracy that had meant the Arts Council spent 12p of every pound it donates on administration. It was just 5p. Action against this sort of bureaucracy and the red tape that government imposes on the arts sector in more direct ways could free significant resources. No ifs, no buts, free museums were here to stay. Following last year's controversy which saw the sacking of his predecessor Hugo Swire, Jeremy Hunt affirmed that free museum access would be protected by a Conservative government. Noting that admissions had increased by 80% he applauded then Culture Secretary Chris Smith's victory over then Chancellor, Gordon Brown. Mr Hunt said that the arts shouldn't be seen in purely 'instrumental' terms by politicians but also in 'inspirational' terms. Quoting Alain de Botton he said that the arts helped us thrive, not just survive. PS There's a really silly story in The Sun this morning that suggests Jeremy Hunt endorsed graffiti. He did nothing of the sort. He merely noted how one piece of graffiti on the M40 - Why do I do this every day? - was an example of how the arts can often challenge us. Tomorrow's Guardian has an ICM poll putting the Conservatives on a record 45%, followed by Labour on 25%, and the LibDems just 5% behind on 20%. If replicated at a general election these figures point to a victory on the scale of Labour's in 1997. 74% of those questioned say Brown has been a change for the worse compared with Blair, just 4% gave him top marks and only 24% think Labour has a chance of winning the next election with him as leader. European levels of spending, but not European levels of healthcare: "Tony Blair sat on Sir David Frost’s sofa and committed the Labour government to matching European levels of health spending. Today, that pledge has been delivered. But despite all this extra money – all that extra spending - we still have some of the worst health outcomes in the whole of Europe... If we improve the NHS so it meets the international average, we could save an extra 38,000 lives a year. If we improve the NHS so our results are comparable to the best countries in the world, we could save over 100,000 lives a year." Building on existing reforms: “Foundation hospitals won't go, they'll stay - and we'll improve them. Commissioning by GPs is right - we'll make it really mean something... actually giving GPs real control over their budgets... Patient choice is essential and we'll make it actually work - we’ll let patients choose any provider that meets NHS standards at delivers at NHS costs." Scrapping top-down process targets: "Superficially, some of these targets may look sensible. After all, no one wants to wait a long time to be seen in A&E. But because they push healthcare professionals to make decisions purely to ‘tick boxes’ rather than because they’re beneficial to the health of their patient, too often the result is worse patient care and a worse health outcome... Labour’s targets are all about chasing good headlines – and nothing to do with the clinical needs and the health of patients. So yes, to make sure our health outcomes are among the best in Europe, a Conservative Government will scrap all centrally-imposed process targets." 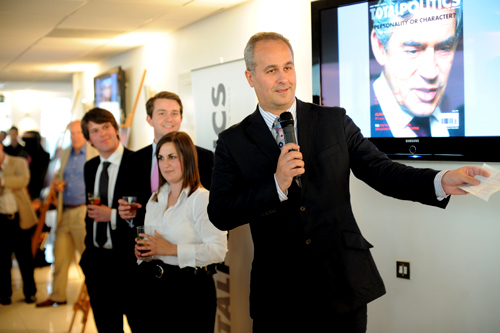 Last night saw the launch of Total Politics magazine from the 29th floor of Millbank tower. Its website went live over the weekend and promises to be a useful go-to point for information about British politics. As well as hosting most of the monthly magazine's content, the website has a repository of political blog links, a daily Q&A with political figures, and a few blogs including a Local Government one that Eric Pickles will be contributing to. ConHome readers might be particularly interested in TP's interview with Lynton Crosby - the man behind Boris Johnson's victory. The magazine is sent to all politicians in the country and is, as its publisher Iain Dale said last night, unashamedly positive about and focused on the political process, rather like the Campaigns & Elections Politics magazine in the US. We wish it well. Party funding where the party had proposed a £50,000 cap on donations and had made much progress in evening out its funding base. He said that more than 130 individuals were now giving £50,000 - reducing the party's dependence on a few big donors. This was, he said later, in stark contrast to the indebted Labour Party which received more than 90% of its income from trade unions and inevitably discouraged it from taking the necessary hardline against public sector strikers. The conduct of MPs: In this area, said David Cameron, codes of transparency had been introduced and transparency was the long-term solution. The conduct of MEPs: This was a complicated matter but it was now clear that the "claiming culture" must end. Mr Cameron said that the Conservatives weren't knights in shining armour - there would be no attempt to repeat Tony Blair's "rubbish" that Conservatives are the new "whiter than white". We, he said, had been part of the problem but would be part of the solution. NHS reform: Tomorrow he would be talking about the NHS. The Conservatives would not engineer another institutional upheaval but would give GPs and patients more choice and would ensure a focus on outcomes, not processes. Zimbabwe: He said this is the most important issue in the world today and he restated the five point action plan announced by William Hague yesterday. James McGrath: In response to a question from ConservativeHome's Samuel Coates ("Boris has released a statement saying that James McGrath isn't a racist and that he was taken out of context. Do you agree with that, and if so do you therefore regret the fact that yet another good man has had to fall on his sword because somebody - in this case a Labour activist - used the 'R' word"? ), David Cameron said that he knew James McGrath well, that he was not a racist but that he had made a regrettable lapse of judgment and shouldn't have used the words he did. Boris acted "rightly" and "quickly" and you have to face the consequences if you make a "terrible misjudgment" in politics. The BBC has made a video of this exchange, including a a question from the complete opposite perspective by the Guardian's Nick Watt. Gordon Brown on Margaret Thatcher: The Tory leader said it was "ridiculous" for Labour to blame Margaret Thatcher for social immobility and what a u-turn it was from his greeting of Lady Thatcher on the steps of Downing Street one year ago. The Government had been in power for ten years and couldn't go on blaming others for its failures. It hadn't reformed welfare, secondary education and the voluntary sector. It was to blame for social immobility. "James is not a racist. I know that. He shares my passionate belief that racism is vile, repulsive and has no place in modern Britain. But his response to a silly and hostile suggestion put to him by Marc Wadsworth, allowed doubts to be raised about that commitment... James's remark was taken out of context and distorted, but he recognises the need for crystal clarity on a vital issue like this. We both agree that he could not stay on as my political adviser without providing ammunition for those who wish to deliberately misrepresent our clear and unambiguous opposition to any racist tendencies." In other words: James is not a racist but I'm not prepared to risk standing up to the people who suggest that he is. In a very strong blog Iain Dale has accused Boris Johnson of a failure of backbone over the affair. Those of us who know James McGrath are seriously angered by this episode. Comments on our previous post on this have been virtually unanimous in their opposition to the resignation. "You will have seen internet coverage of remarks made by one of my advisers, James McGrath. I ask you to look at the context of the remarks and judge whether the author of the piece - a Labour activist - is a fair-minded person or someone with a political agenda. I know James and I know him not to be a racist. He wouldn't be part of my team if he didn't share my belief that London is greater because of its diversity. He wouldn't be part of my team if he wasn't committed to my agenda of building a London where every citizen is respected regardless of race, religion and sexuality. There have, of course, been calls from some quarters for me to sack James but I will not. To do so would only encourage more malicious and vexatious allegations against my staff and other public figures. In these cases it becomes not about what somebody has said, but about how the media think somebody, somewhere could wrongly perceive what they said. Racism is still a real problem in too much of society but we devalue real incidents of racism when we over-react to unfortunate uses of words. I want to put an end to the gotcha style of journalism that is always determined to think the worst of people. Most Londoners are fair-minded and want to think the best of people. My administration won't be bullied by the politically correct. Our priorities are fighting crime, improving educational opportunity and affordable housing. James will continue to help me in those tasks. I will not throw a good man to the wolves."